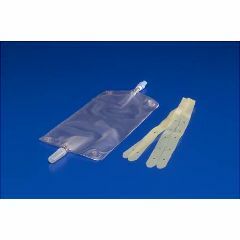 Sterile fluid path, one-way flutter valve; twist valve at bottom with soft cloth leg straps. Tried several and this is the best! The stationary tab to attach the straps to secure the bag are the best we've found. Hope allegro will always carry these bags. Would be lost without them. The drainage valve is secure so we don't have to worry about leakage. stationary strap tabs. connector to long. stationary rubber tabs for straps are difficult to use. Plastic button on Bard bags are better. Lightweight. Convenient. it has buttons on the bag. twist is stiff. twist valve is stiff. best leg bag and we've tried several. Sturdy. Lightweight. Convenient. empties easily. straps hold bag secure as it fills due to placement of attached buttons. Very good product. Only one we use.